If you’re trying to nail down everything in your life that influences the choices you make when it comes to the foods you eat, one of the key starting points is to understand your environment. When trying to develop healthy eating habits, it’s easy to fall prey to factors that seem like they’re beyond your control. The places you eat, the way you choose the foods you put on your plate, the people you surround yourself with, where you buy your food, and how that food is presented to you by the culture you live in, all have a serious impact on your decisions. So it’s up to you to take control of your health. By identifying the contributing elements to your choices you can have a serious leg up in the fight for better nutrition. Here are five ways your environment influences what you eat and some tips on how to stay healthy despite your surroundings. You can pick up unhealthy foods all over the place these days. Food is made available in gas stations, at sporting events, in the park where you exercise, at your school or office, and just about any other place you frequent. Because of these constant temptations, you may be more likely to stop and indulge in some of these foods. And most likely, the food served in these places aren’t the most nutrient dense options. Convenience stores are especially at fault when it comes to serving processed foods, just like fast food restaurants. If you work or go to school in an area that doesn’t have many other choices than a quick burrito or cheeseburger, you may be more likely to settle for those foods than go hunting for a healthier option. Even if you don’t particularly want to eat or enjoy the food being served, you may still keep putting your fork in your mouth if the environment you eat in encourages it. Brian Wansink of Cornell University, author of Mindless Eating: Why We Eat More Than We Think examines the way environment shapes eating behavior. Sitting by a window in a restaurant – means you are 80% more likely to order salad. Sitting near the bar – means you’re 73% more likely to order dessert. Wansink also pointed out how simple factors like where you put your food in your kitchen can change your eating habits. If you place unhealthy foods in the easiest to reach, out in the open locations of your kitchen, you may be fooling yourself into prioritizing those foods over the healthier options. The research also showed that people are three times more likely to eat the first thing they see than they are to eat the fifth thing they see. What about the utensils you eat with? You probably only think about your fork as a means of shoveling food into your face, but could its size actually affect how much you eat? According to a study from the Journal of Consumer Research, it absolutely can. 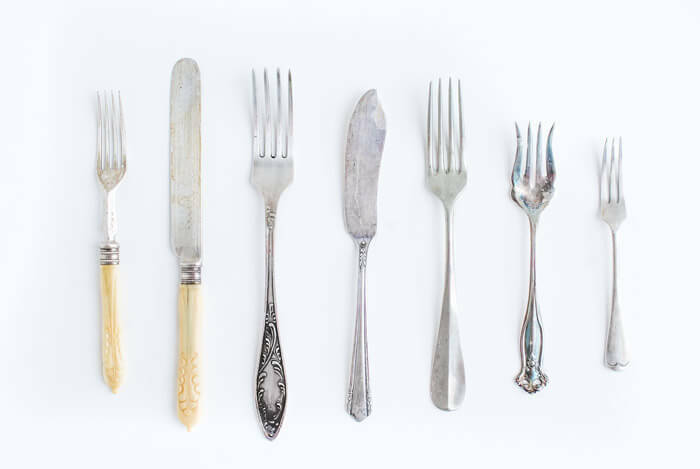 Restaurant-goers who ate with forks that were 20% larger than the average fork ate less overall and left more food on their plates than did people who ate with regular-sized forks. One explanation for this could be because people eating with smaller forks feel that because they’re getting less out of every bite, they aren’t adequately quelling their hunger. A study from the Georgia Institute of Technology demonstrated that people ate 31% more ice cream than they would have had they eaten out of a smaller bowl. The same research showed that people eat about 92% of what they serve themselves. If you serve yourself more of something, you’ll be more likely to eat more of it! Another contributing factor to this problem is the increase over the last few decades of portion sizes. People are finding it harder to lose weight than ever because the same foods they ate 30 years ago are now coming in larger sizes and with worse nutrition value. You can take control by educating yourself and being mindful of serving sizes. If you reach into your cupboards for a box of cereal, check and see how much one serving size actually is. Believe it or not, a full bowl may be closer to three servings than one. You can ask for a to-go box with your meal and leave on your plate only what you want to eat, saving the rest for later. The people who you eat your meals with can have a powerful effect on what you choose to put on your plate and into your mouth. The Harvard School of Public Health says that many of the food preferences you take into adulthood are based on what your family of origin ate as you grew up. Depending on your heritage, you may gravitate towards meals that reflect your cultural background. While foods that come from your heritage may be delicious, they aren’t always the most nutritious option you can find. Not only will your built-in subconscious biases toward certain foods affect what you eat – anyone you eat with can influence what you choose. A researcher named Solomon Asch conducted a study on social influence and found that when people are left alone to find the answer to a simple question, only one person out of 35 will get it wrong. But when you put that same group of people together and have some of them give intentionally wrong answers, 75% of all participants will ignore their own reasoning and side with the group’s wrong answer. 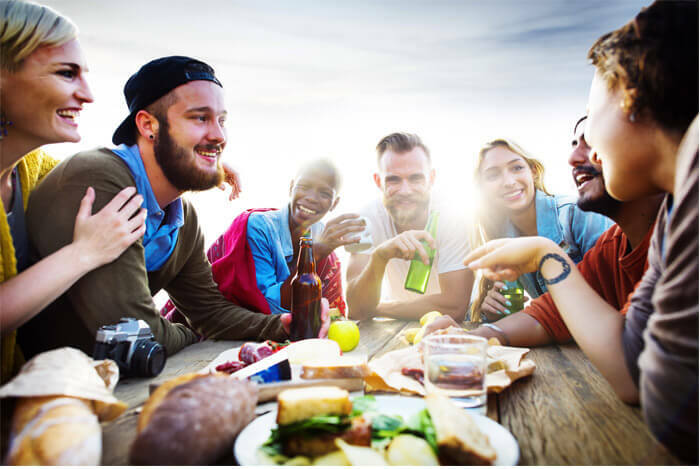 Social pressure can be overwhelming, and you may not even realize that you’re giving into these pressures, especially when you’re in a casual, comfortable environment surrounded by your peers. Another study found that once your friends start gaining more weight, so will you. You may also be influenced by something as simple as what your friends are choosing to eat. You may have gone into the meal with the purest intentions of eating light and healthy, but once you start hearing what everyone else will be having, you start throwing caution to the wind. The best way to counteract these forces is to go into meals with a game plan. Know what you’re going to eat beforehand, and stick to it. If you have to actually make the effort to announce to your friends that you won’t be swayed by their food decisions, do so. Be aware of this powerful influence of peer pressure at all times, or as much as you can manage. When you see your friends absentmindedly reaching for a handful of chips, you don’t have to mimic their motions. Consciously stop yourself from joining in the group-think of casual eating. You can also order first, or prepare your food before others do. If you’ll be at a party where the food selection may be limited to the unhealthy foods prepared by the hosts, bring your own food or grab a quick bite to eat ahead of time. As mentioned before, one’s cultural heritage has a lot of influence on what one might eat. But because today’s culture is so saturated by clever advertising, we may be persuaded into buying products we may otherwise have had no need for. Research from the Yale Rudd Center for Food Policy and Obesity found that TV commercials for snack foods increased the consumption of those foods before and after airing. Advertising is pretty brilliant in a lot of ways. When we see a commercial, sometimes we shake our heads and scoff – how could anyone fall for it? But the ads aren’t just there to tell you why you should buy the product. They also associate the product with good vibes, showing you celebrities and happy, smiling people enjoying their products. Psychologists call this affective conditioning. News and advertisements are often crafted to influence the emotional part of the brain, which is why after you hear someone on television talking about a new product, you feel the urge to give it a shot. The way food is packaged alone can have a huge impact on what we choose to buy. When healthy, organic foods come in simpler, more economical packaging, unhealthy foods are often displayed in bright colors with exciting imagery. The “halo effect” is a cognitive bias that convinces us that a product has more valuable traits over others simply because the perception of that product has been subtly altered. Marketers are fully aware of this effect and use it to their advantage – that’s why bold health claims on packaging may influence you to buy one product instead of the same item sitting next to it without those words on the box. The places where you shop for food have become exceedingly efficient at subtly convincing you to purchase the products they want you to buy. 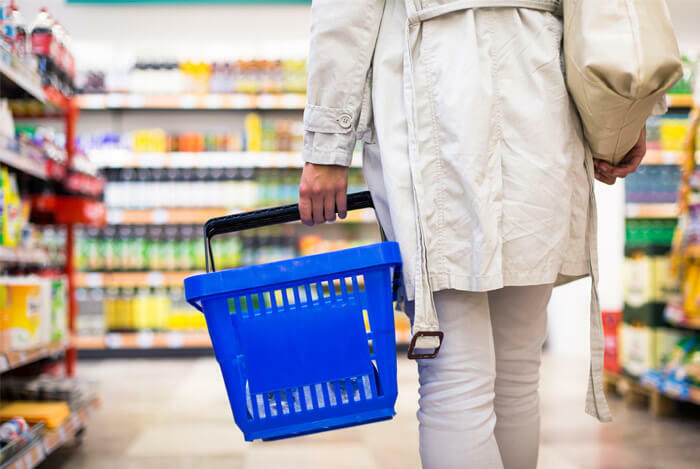 Instead of small baskets, shopping carts are large, perhaps influencing you to put more items inside it so your single box of granola bars don’t feel so lonely. The items people need most in grocery stores, eggs, milk, bread, are strategically placed for the maximum effect. Baked goods and fresh meats are often put nearer to the front, where their pleasurable aromas assault your senses, putting you into a better mood and increasing your hunger ever so slightly. Eggs and milk are often placed nearer to the back corners of stores so you have to pass the myriad of other temptations on your way to find them. 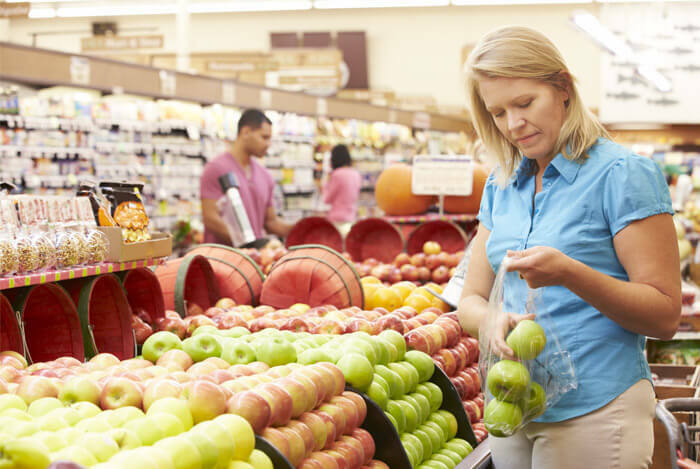 Name brand items are often put on middle and top shelves that are more likely to draw the eye, while the cheaper (and sometimes healthier) foods are placed lower down, or on the far end of aisles where you have to hunt them down. Don’t fall for their tricks! Before you go to the grocery store, create a shopping list and follow it. Buy only what you need to create nutritious meals. If you want to be as healthy as possible, recognizing the ways your environment can influence you into making poor choices is one of the best ways to combat and overcome it. Peer pressure, eating habits, the media, all of these may seem as though they’re uncontrollable. But equipped with this knowledge, you’ll be able to recognize the effects they have on your decision making and choose more wisely from now on. What’s your take on how your environment influences your eating habits? Have anything else you’d like to share? Let me know in the comments below!